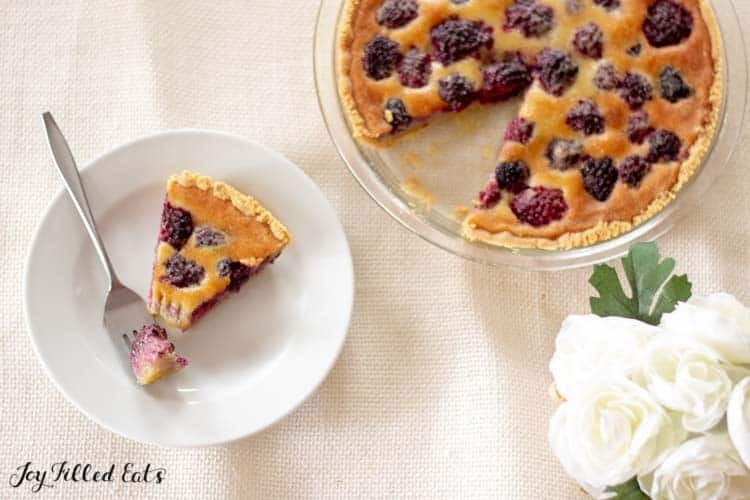 I love pretty desserts and this Blackberry Custard Pie is as pretty as they come. With a press in pie crust & custard made right in the blender, it has just 10 minutes of prep time. One of my favorite things is my friend Kristen’s Pear Pie. A few months ago I made a healthy version of that but, alas, it hasn’t been too popular. 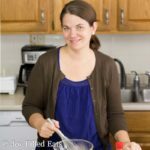 I think the fact that it is an S Helper for Trim Healthy Mamas and has 10 net carbs for my low carb readers has kept it from being one of my top recipes. 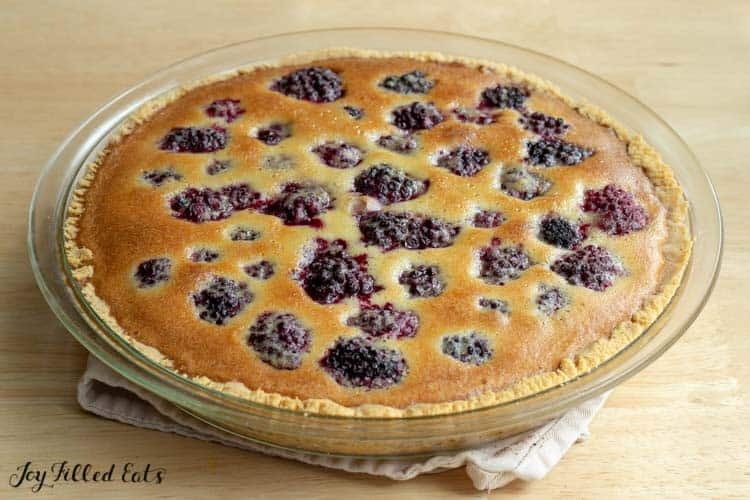 I decided to make that custard pie with berries to make it an S and low carb. As always it is sugar and gluten free. Sometimes I make custard pies with crust and sometimes I make them without. I felt like a crust when I made this last week. I also shared it with a group of my girlfriends and it was a hit. And I’m the only low carb, trim healthy mama out of our group. Those ladies have been my taste testers more than once. They usually do so happily. 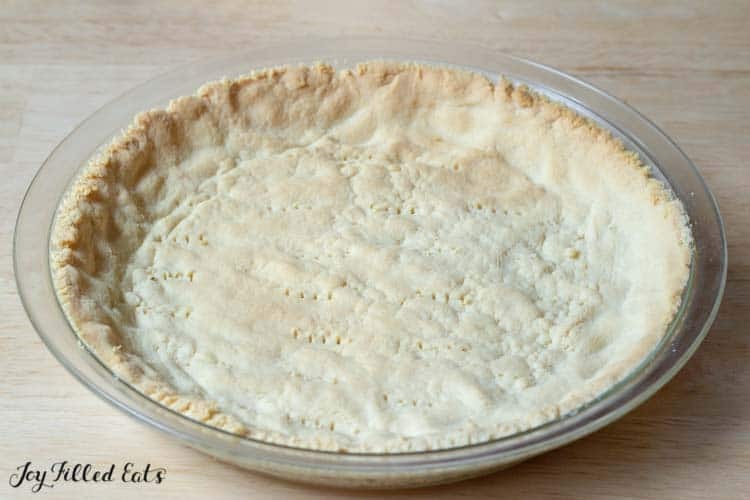 This is an easy almond flour pie crust that mixes up in the food processor and then gets pressed right into the pie plate with your fingers. No rolling pin required! Almond Flour – I’ve come to prefer almond flour in baked goods. It has a mild flavor and gives a tender crumb in cakes, cookies, and biscuits. Cold Butter – Using cold butter helps the crust mimic the flakiness of a traditional pie crust. And butter has a much nicer flavor than shortening. Cold Water – Same as above. We use cold ingredients for the pie crust to help them get nice and flakey while baking. How do you keep a pie crust from getting soggy? One of the easiest ways to do this is to blind bake it. This crust doesn’t need pie weights, just prick with a fork a few times and bake it for 10 minutes. This helps it to not get soggy from the custard and the berries. 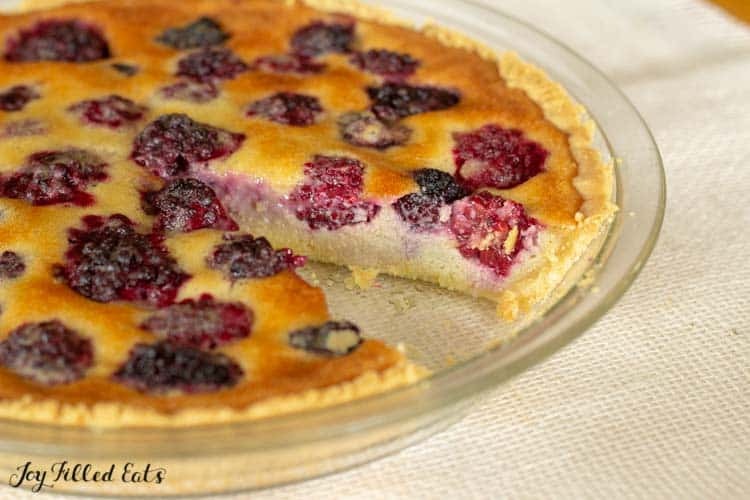 Can I use other types of berries in the Easy Custard Pie Recipe? Of course! I do recommend using frozen berries. 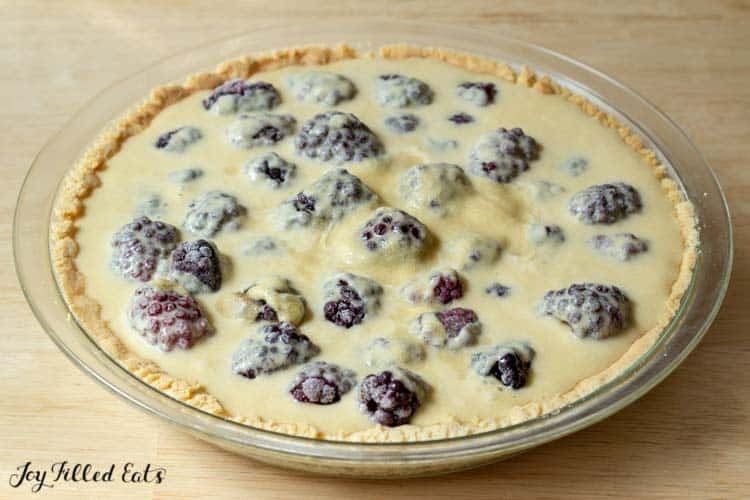 When you use frozen berries the custard gets a chance to begin to set before the berries release all their juices. 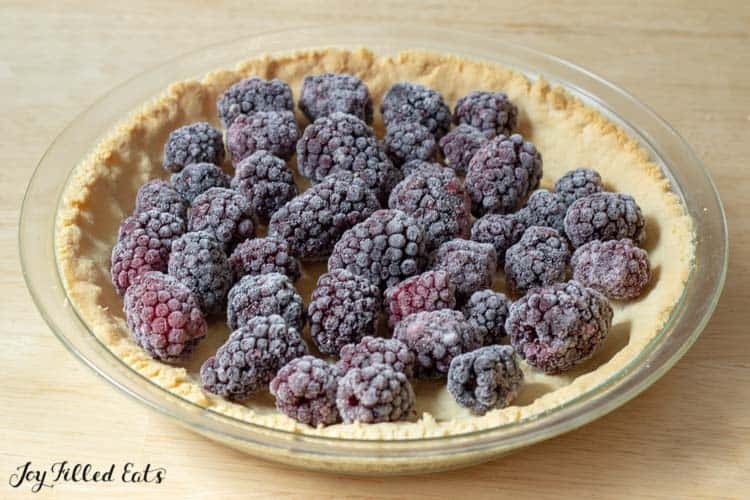 Frozen Blackberries or other Frozen Berries – I use frozen berries in this custard pie so that the custard gets a chance to begin to set before the blackberries release their juices. Raspberries and blueberries work very well, as well as a combination. Strawberries are a bit big unless you can find the frozen slices without added sugar. Eggs – Eggs are the binder in this custard and cannot be substituted. 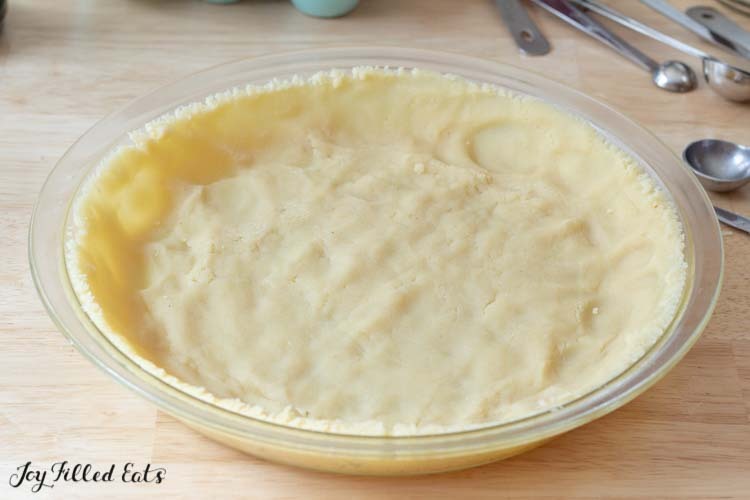 Softened Butter – I use softened butter for the custard so that it can easily mix into the eggs. Vanilla – With the price of vanilla having gone up drastically the last few years I decided to try a Mexican vanilla extract and have been happy with the results. It is much much cheaper than other vanilla extracts, running about $1 an ounce. Almond Flour – Using a little bit of almond flour in the custard helps it to thicken. Making a baked custard using my method is very easy. Simple blend eggs, butter, sweetener, vanilla, and almond flour. Once you do that you can pour it into a pie plate (with or without a crust) or individual ramekins and bake them. 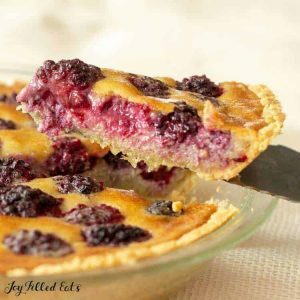 I love pretty desserts and this Blackberry Custard Pie is as pretty as they come. With a press in pie crust & blender custard it has just 10 minutes of prep time. Put the almond flour, coconut flour, and butter in a food processor and pulse until crumbs form. Add the water and pulse until it comes together in a dough. Press into the bottom and up the sides of a pie plate. Prick the bottom with a fork. Bake for 10 minutes. 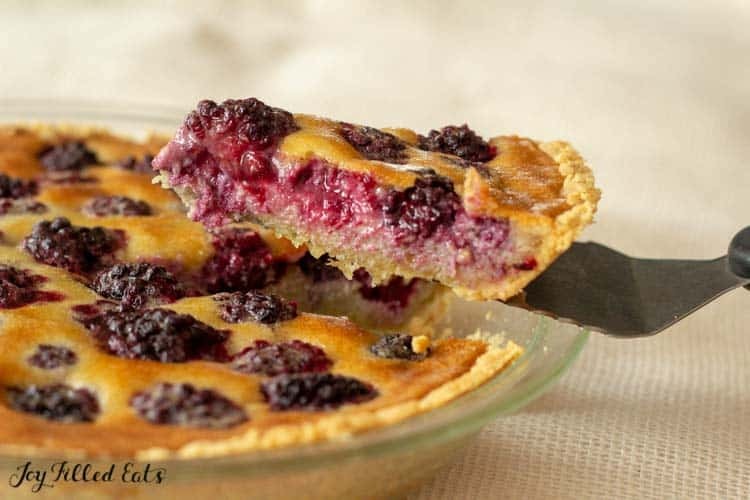 Remove from the oven and scatter the blackberries over the crust. Combine the rest of the ingredients in a blender and blend until smooth. Pour the custard over the berries. Bake for 40-50 minutes until the center isn't jiggly and the pie is golden brown. Cool completely and then chill in the fridge for a few hours before serving. Originally Published August 21, 2016. Revised and Republished April 10, 2019. Love the way this pie looks. Your crust looks better than mine!!! We made this the other day and everyone loved it.Going to make it again for family gathering this weekend! Would fresh blueberries work or would they be mushy? Fresh blueberries would work. Enjoy! Looks great, can i use frozen blueberries? Thank you, this looks good! It seems strange not to have any kind of milk in a custard pie, though. Is that an error, or is the filling basically baked eggs? No milk. This is definitely custardy though. It is a thicker custard before baking. I converted an old family recipe from a friend and her original recipe does not call for milk either. This reminds me of the cherry custard pie my mom used to make at C-Mas. Cannot wait to try this. This looks great. 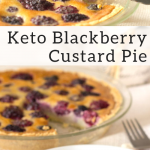 Do you think it work without the crust as it is, or would I need to increase the custard ingredients? This looks fantastic! Hard to believe it is low carb ??? Taryn. I love this. My grandmother gifted me with her Current Custard Pie recipe when I was a young woman. I was never able to find currents. The recipe holds such nostalgia for me. I don't know why I never thought to try making it with another fruit. This looks so beautiful - just perfect. Thank you for sharing the recipe and reminding me of my Nana. I saw currants while on vacation last month in Quebec City. They are hard to find. They are so beautiful. I wonder if you could grow them? I had what I thought was a raspberry bush but it was actually a gooseberry bush. Those are unique as well. (I still kinda wish it was a raspberry bush though).